Almeda 816, 8340417 Santiago von Chile, Chile. 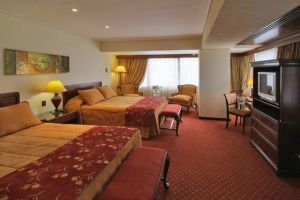 The Hotel Plaza San Francisco was first built in 1989 and has since become the newest 5-Star luxury hotel in downtown Santiago after undergoing extensive renovation works and remodeling. 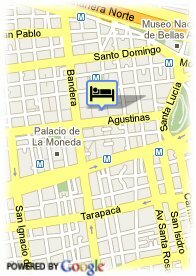 Located just a short distance from the heart of Santiago, it offers unbeatable possibilities of sightseeing well within walking distance of the hotel. Nearby, visitors can find the Government palace as well as some of the most important national monuments. Convention centers and cultural activities are also to be found in the vicinity; among these are the Diego Portales Building, the Museum of Fine Arts, and the Opera House. Our modern rooms - 140 standard rooms and 15 suites -reflect a perfect harmony of noble woods, exclusive upholstery and stylish furniture. Valet Parken, Kostenlose überdachte Parkplätze beim Hotel, Reservierung erforderlich, Bus Parkplätz. nähe dem Messegelände, Bahnhofsnähe, Park, in der Nähe der Universität, Stadtzentrum, Museenviertel, Autobahnnähe, in der Nähe der Altstadt, in der Nähe der U-Bahn / Strassenbahn, Panoramische Aussicht, in der Nähe der Einkaufszentrum. Kinder weniger als 8 Jahr(e) alt: gratis. Visa, Diners Club, Maestro, Mastercard, American Express, Red Compra.